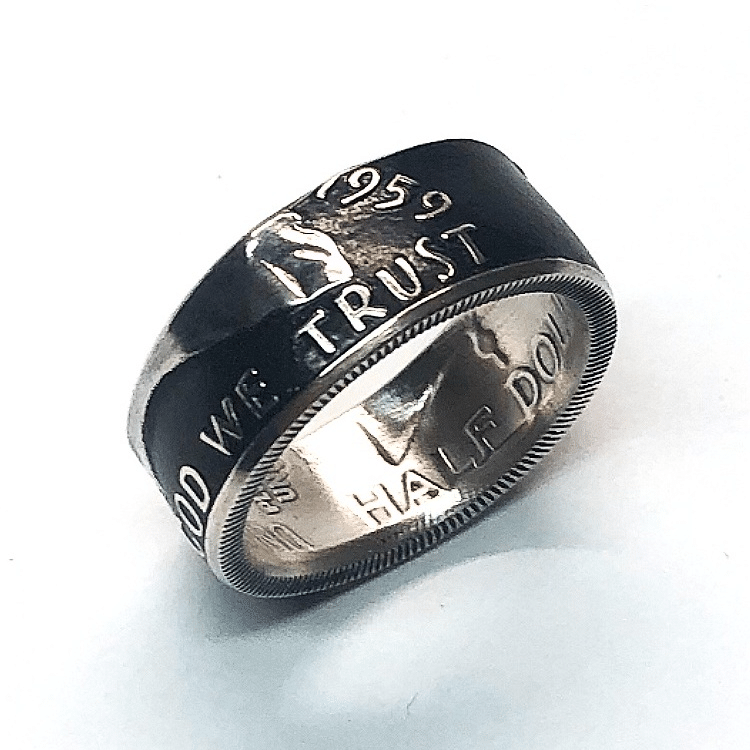 The Benjamin Franklin Half Dollar Coin Ring is a handsome coin ring very popular with the baby boomer generation given it’s years of minting. This classic coin ring will never leave any discoloration on your finger as with all coins minted prior to 1965 it is made of 90% silver. The Franklin half dollar is a coin that was struck by the United States Mint from 1948 to 1963. The fifty-cent piece pictures Founding Father Benjamin Franklin on the obverse and the Liberty Bell on the reverse. A small eagle was placed to the right of the bell to fulfill the legal requirement that half dollars depict the figure of an eagle. Produced in 90 percent silver with a reeded edge, the coin was struck at the Philadelphia, Denver, and San Francisco mints. Mint director Nellie Tayloe Ross had long admired Franklin, and wanted him to be depicted on a coin. In 1947, she instructed her chief engraver, John R. Sinnock, to prepare designs for a Franklin half dollar. Sinnock’s designs were based on his earlier work, but he died before their completion. The designs were completed by Sinnock’s successor, Gilroy Roberts. The Mint submitted the new designs to the Commission of Fine Arts (“Commission”) for its advisory opinion. The Commission disliked the small eagle and felt that depicting the crack in the Liberty Bell would expose the coinage to jokes and ridicule. Despite the Commission’s disapproval, the Mint proceeded with Sinnock’s designs. After the coins were released in April 1948, the Mint received accusations that Sinnock’s initials “JRS” on the cutoff at Franklin’s shoulder were a tribute to Soviet dictator Joseph Stalin(Stalin did not have a middle name that began with an ‘R’). No change was made, with the Mint responding that the letters were simply the artist’s initials (The same accusation was made after the release of the Sinnock designed Roosevelt Dime in 1946). The coin was struck regularly until 1963. Beginning in 1964 it was replaced by the Kennedy half dollar, issued in honor of the assassinated President John F. Kennedy. Though the coin is still legal tender, its value to collectors or as silver (intrinsic value) both greatly exceed its face value.